The Tip Top Toy Company was founded in New York city in 1912 by Max Politzer and Joseph Kaempler, both of whom were former employees of the New Toy Company. Some of their dolls were distributed thru George Borgfeldt, who even gave them licensing to make a 13" tall bisque Kewpie doll named Pudgie, sold in the USA. Tip Top made the Paul doll and Virginia doll, both antique composition headed dolls with side glancing eyes. They made Tip Top baby dolls and Walking toddler dolls, 18-24" tall, babies with bent limb or straight limb kid or cork stuffed jointed bodies or toddlers with composition jointed walking bodies, sleep eyes. Some of these dolls may bear the Tip Top Toy Company doll mark TTT (with or without the company name included in the marking). 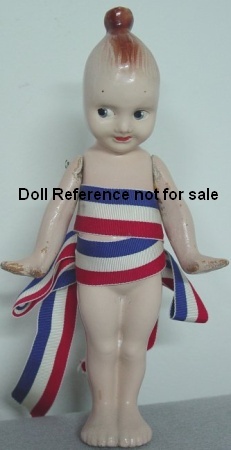 Shown left; 1915 Maiden America doll, The National Doll, 8" tall, all composition jointed only at shoulders, painted molded hair, painted side glancing eyes, wrapped in a red, white and blue ribbon, had a paper label with description on front. Advertised that you could "wash the doll anytime" - we don't recommend this - ever - but this could explain why these dolls are rather scarce. Tip Top Toy also made or distributed metal and wooden toys and the bisque head doll line Tausendschönchen doll (Daisy doll) & Little Boy Blue doll, both made by Franz Schmidt, Tip Top handled the American composition dolls; Bertie doll and Gertie doll, Dottie Dimples doll, Cy from Siwash doll, Jim Thorpe doll, Miss Firefly doll, Little Johnny Jones doll, Little Miss Sunshine doll, Mistress Mary doll and they were the distributor for the Maiden Toy Company dolls in 1918 and the mechanical Shimmy dolls made by Zaiden Toy Works. Tip Top appears to have stopped making dolls about 1921, but still continued to produce toys into the 1940s.